When it comes to great design looks, be it in dresses or decor, sometimes it is the quiet, subtle pieces that produce the most impact. Neptune’s new Keswick collection of occasional tables is a case in point. A celebration of brass and glass, Keswick’s coffee, console and side tables are the equivalent of a little black dress for the home. Inspired by the glamour of the art-deco era, they look sophisticated whether you use them for storage, display, or simply as a practical occasional table. And the inspirational designers at Neptune have plenty of ideas on how we can make the most of these elegant creations in our homes. Perhaps the most versatile piece in the collection, the Keswick console table, with its slender profile, works well in narrow entryways and can hold its own in a more spacious setting. If you like to be creative you could use them alongside a kitchen island to create an impromptu, but sophisticated, breakfast bar. They are just the right height to sit at and just wide enough to eat comfortably on, without taking up too much space. The Keswick coffee table is also full of creative potential. Lightweight in looks and subtly reflective, it makes a stunning centrepiece in a living room. But always thinking outside the box as it were, Neptune designers suggest that by combining two Keswick tables in a staggered formation you can place your most beautiful books and vases on the shelves to create an elegant still-life. In another ingenious move, the Keswick small cube coffee table and rectangular side table were designed to be on the floor, however, they do not have to be used this way. Placed on top of a counter or sideboard, for example, these pieces can become a wonderful framework for a cocktail bar. 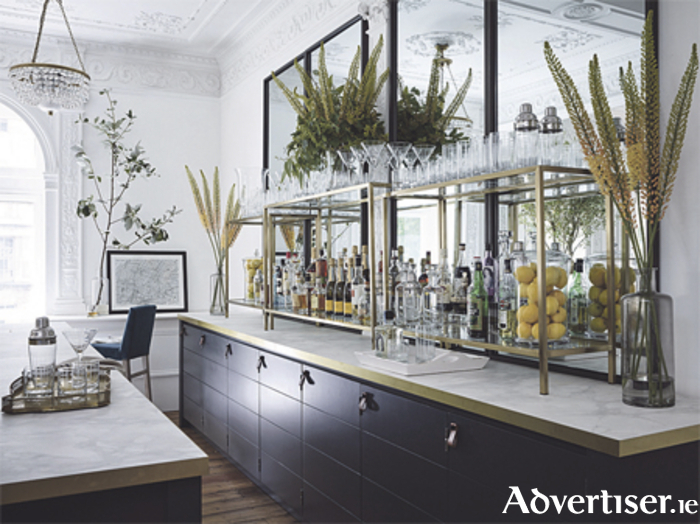 You can arrange your bottles on the lower shelves, and glassware on top and a mirror behind the tables will add a touch of art deco-style glamour. Speaking of a little extra glamour, how about using the console tables in a bathroom or bedroom to display favourite perfume bottles and jewellery? Equally, the cubed coffee and rectangular side tables could sit alongside a bathtub to hold bath oils and scented candles for unwinding in the evenings. Altogether, the Keswick from Neptune really is the most captivating tale of when brass met glass.